75% of older consumers of luxury brands are ready for omnichannel interactions. Surprised? Luxury brands lag other consumer sectors when it comes to understanding and applying digital technologies, according to a “Digital or Die” report from BCG; and the speed of technology development is endangering their current business models. Importantly, the report cautions that younger consumers are by no means the only ones pulling luxury brands toward digital. 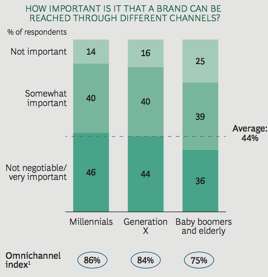 Fully 75% of baby boomers and older people who buy luxury brands say they are ready for omnichannel interactions, compared with 86% of millennials. Furthermore, in Japan, Russia and other markets, BCG found that older generations are the heaviest online shoppers for luxury goods and services. Digitization now affects all consumer segments. Overall, more than 40% of consumers expect to be able to have two-way interactions with brands—at the very least, sharing feed-back and opinions and, when necessary, speaking with online service reps and getting instant replies to their questions. The consequence for brands: they can no longer rely on “push” marketing alone. Another consequence is that marketers must understand the needs and abilities of customers of all adult ages if they are to provide a truly age-inclusive brand experience and appeal to the widest possible customer base. While behavioural differences can be influenced by age, by far the most important considerations are the physiological changes we all experience as we age. Universal, relentless and mostly inevitable. We explain the 25 physical effects of ageing in this free download. Make an e-tail experience fit for all ages? Change everything and nothing.